Your heart and your lungs are intimately connected, and the health of one of these organs can have a major impact on the other. At Winchester Hospital, we provide expert care for both. Many people with heart or lung problems first encounter Winchester Hospital through our Emergency Department. In an emergency involving your heart or your breathing, you can be assured you are in expert hands. If you need hospitalization while your heart or lung problem is being treated, Winchester Hospital offers a full range of diagnostic, medical, surgical and specialty services. The physicians on our medical staff represent all medical specialties, and many are affiliated with Boston’s finest academic medical centers. Our investment in advanced technology includes the recent addition of 16 telemetry beds, which continuously monitor patients' heart rates and rhythms. If a patient develops cardiac problems, the technology alerts staff members immediately so the patient can receive the appropriate diagnosis and treatment. Winchester Hospital now has a total of 87 telemetry beds, which has enhanced our capabilities to care for patients recovering from heart- or lung-related events, at risk of such events and experiencing ongoing problems as a result. Find a doctor who specializes in cardiac and pulmonary care. After a heart attack or other heart problem, many people need cardiovascular rehabilitation. The Cardiovascular Rehabilitation Program at Winchester Hospital, a member of Lahey Health, can help improve your heart health and get you back to the activities and lifestyle you enjoy – with confidence and security. 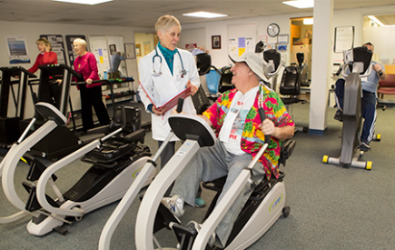 Our Cardiovascular Rehabilitation Program gives you more than just a place to exercise. Our trained staff monitors your vital signs to help you make safe, steady progress and shows you how to lower your risk of future cardiovascular events. Our program will help you achieve a healthy level of cardiac fitness following bypass surgery, cardiac catheterization with angioplasty, stent placement and heart attack. Conditions such as CHF and stable angina may also be addressed. Heart failure happens when the heart is unable to deliver enough blood and nutrients to meet the body’s needs. According to the American Heart Association, heart failure is the most rapidly growing cardiovascular disorder in the U.S., affecting 4.9 million people and responsible for 555,000 new cases annually. Winchester Hospital offers a free Outpatient Heart Failure Program to help care for and educate people with heart failure, and to identify worsening symptoms as early as possible. Learn more about the Heart Failure Program.